If you have good typing skills and want to work from your home, consider home typing jobs. You can provide clerical services to companies looking to outsource them. But beware of scams that ask you to cough up money up front. Ensure that you do not fall prey to the hundreds of scam schemes that are found on the Internet. Look up our guide to home typist jobs to keep abreast of the goings -on in the home typing job scene. Work at home typing jobs include data entry, typing, providing clerical service and customer service. If you can handle computers and have an exceptional speed in typing, then home typing jobs are for you. Home typing jobs also include ad typing and information processing. In order to be a successful work at home typist, you need to decide on where to start. However, work at home typing for a legitimate employer is not that easy, as scams are on the increase. 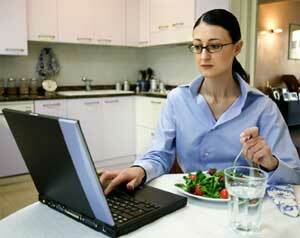 As a work at home typist you normally set up and prepare reports, letters, mailing labels, and other text material. Home typing jobs also include preparing neat and error free typed copies of materials written by other clerical, professional or managerial workers. As a work at home typist, you may begin by typing headings on form letters, addressing envelopes or preparing standard forms on typewriters or computers. Home typing jobs encompass light data entry and typing, answering incoming mail and processing orders. You may be required to type in ads on the Internet. Most companies provide information and training so that you are guided as to where to post the ads and how to answer queries. If you have decided to take on work from home typing assignments, then there are few things you need to be aware of. You should be able to see through the hype that accompanies most scam job offers. Most of the ads you see in the classifieds are scams and very few actually offer anything worth your while. You can find hundreds of advertisement claiming that you can earn up to $500 through home typing jobs. They will ask you to fill a form and send it to them along with a registration fee of $65 or above. In a few days you'll get a starter pack and information containing a long list of companies that may be looking for a work at home typist. You may have to call up the companies in the list and find out if they are recruiting, at which point you are likely to discover that most of these companies don't even know they're on the list. Other home typing job scams involve application processing fees and initial expenditure for covering specific software programs. Instead of a work from home opportunity, you might find yourself at the receiving end of marketing mail and spam that will inundate your mailbox. All you would need to start your work at home typing business is a computer connected to the Internet and printer. Word processing jobs can range from typing documents or projects to resumes for companies, students and of course your neighbors. Your work at home typing job can also include typing business letters and manuscripts. You can initially start your work from home typing jobs by helping your neighbors; this would help you establish your market. Then slowly and carefully look out for companies that outsource typing jobs. Establish your workspace before beginning your search for work at home jobs. Apart from PC with Internet access, your home office should include printer, fax machine, file cabinets and of course a telephone. Prepare your resume and post it online. This should help you get projects. And of course, companies which look in for work at home typist do ask the resume of the candidate in order to analyze their subject knowledge.